YOGA NEPAL: Blog — YOGANEPAL.com - Join Our 10-Day Yoga Retreat & Life-Changing Pilgrimage in Nepal! 10 Poses in 10 Minutes! Cory Bryant returned to YOGA NEPAL last March and led us on a yogic journey through the sacred sites, temple towns and Tibetan Buddhist monasteries of the Kathmandu Valley. We had the chance to explore the intersections of yoga and Buddhism and to connect with the full breadth of yoga practice, uncovering the grounded stillness within ourselves that opened us to the lessons and experiences of this magical place. Here are some quick tips from Cory to get your daily practice going. "One of the main reasons for doing asana is to develop and maintain a sound body that is able to sit in meditation posture and find stillness. Asana means "seat", which can be further expounded to mean "connection to the earth". Your connection to the earth can be strengthened through an asana practice that is grounded and comfortable. The Yoga Sutras of Patanjali tell us that asana should be "stirah sukham asanam", which means "my connection to the earth should be steady and joyful". When you do asana practice, be sure to pay attention to where and how your body is positioned relative to the earth (aka, floor in most cases). Take note of which limbs and/or parts of your body are being used to establish your foundation. This is your connection to the earth. Bring awareness to the pose and be sure this connection is grounded, balanced and steady. From there, you can move further into the pose with the free parts of your body. The "Jivamukti Magic 10" is a great way to warm up the body, calm the mind and prepare for seated practice. This is a simple asana routine that can be done in only 10 minutes, yet it opens up the energetic flow of the whole body. Adho Mukha Savasana (Downward Dog) - From tadasana, plant hands and step back to plank. Extend the body flat, on balls of feet with shoulders directly above wrists. This is the correct distance between hands and feet. Lift the sits bones up and drop the heels toward the floor keeping arms and legs extended. Affirm your connection to the earth by spreading the fingers wide with middle finger pointed forward, hands shoulder width apart. Place emphasis on the forefinger and thumb, slightly rotating the forearm in while rolling the shoulders open and down the back, creating space across the upper back. Feet are hip-width apart. Drop the head. After 10 breaths, walk the feet forward and fold over the legs to uttanasana. Uttanasana (forward fold) - From down dog, walk the feet forward to the hands. Inhale, look up and lengthen through the top of your head with feet together or apart. Spread the toes wide and evenly connect to the earth through the feet. Then drop the head and fold over the legs. Bend the knees as needed and with each inhale lengthen the spine and use the exhale to fold deeper and further extend the legs. After 10 breaths, walk your feet out to the edges of your mat and squat down to malasana. 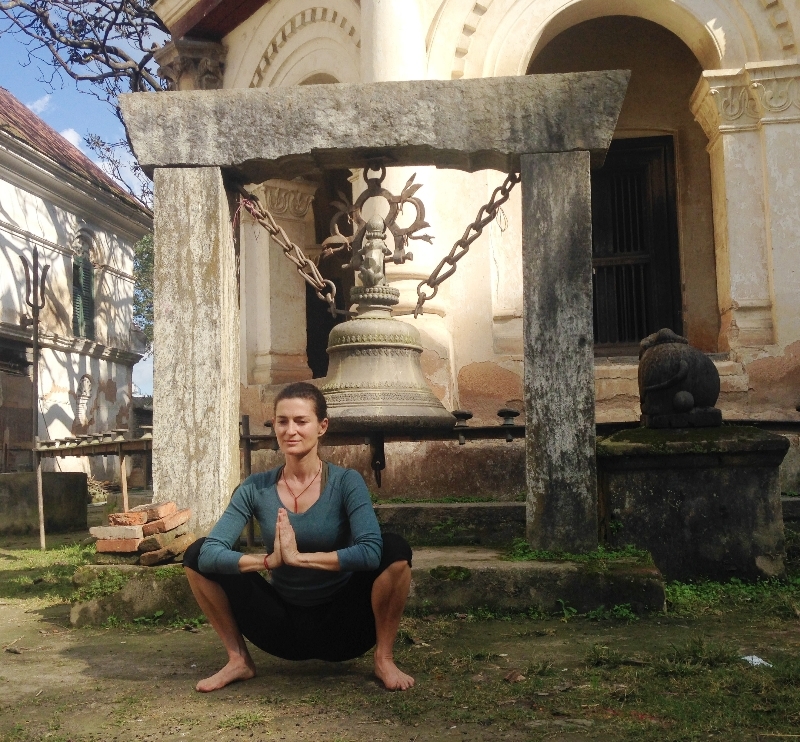 Malasana (squat) - Feet mat-width apart, knees tracked over middle of feet, spine extended, hands in prayer at heart, using the elbows to open the inner thighs, press heels down into the floor, into a folded blanket or sit on a block. After 10 breaths, take a seat on the floor. Teepee Twist - 5 breaths each side. Seated with soles of the feet on the floor, feet and knees together, bend the left elbow and embrace both knees with the left arm, right hand on floor behind you, twist to the right. Do the left side. Then extend both legs straight. Ardha Matsyendrasana - 5 breaths each side. Bend the right knee and cross the right foot over the extended left leg, placing the right foot adjacent to the outside of left knee or further down near left foot. With the left elbow bent, press the outside of left arm against the outside of right leg. Repeat on the left side. Then extend both legs straight. Table Top - 10 breaths. Separate your feet hip-width apart and bend the knees. Place your hands behind you on floor, fingers pointing toward the feet, chin to chest. Inhale and lift up. Exhale and extend the head back. (The pelvis should be lifted as high or higher than knee level, with ankles under knees and wrists under shoulders). Handstand - 5 to 25 breaths. Place hands on the floor about 3-5 inches from a wall, and leading with one leg kick up and follow with the other. Then rest the heels on wall, feet flexed, and drop the head between the arms. If kicking up is too challenging, try a modified handstand. Start on hands and knees, feet to the wall, and walk up to a 90 degree angle. Finish by simply hanging over your legs in uttanasana (no need to rest in child's pose). Then stand up for posture alignment. Standing Posture Alignment - 5 breaths. Standing in tadasana, interlock the fingers behind the back, pressing the palms together. Lift the arms away from pelvis. Lift your heart and drop your chin to meet your lifted chest. Standing Side Bends - 4 breaths. Extend the arms overhead, interlock the fingers, pressing the palms together. Inhale and lengthen the spine. Exhale and bend to the left side. Inhale to the upright position. Then exhale and bend to the right. Repeat once more to each side for a total of 2 rounds. Then inhale and come to an upright, standing position. Standing Spinal Roll - 16 breaths. and spread the elbows wide. Exhale: Arch back. Continue to lift with each inhale and lean back on the exhale for a total of 3 breaths. Exhale: Draw elbows towards each other, chin to chest, and slowly begin to roll down. Eventually bring your forehead to/toward your knees. Once there, slowly roll back up to standing and release the arms. 1. Choose your seat. You can sit cross legged, on a chair, or you can even stand. The important thing is that you purposely choose it such that you can find comfort and stillness. 2. Be still. Bring the mind to the body. For these 5 minutes, see if it is possible not to move, observing sensations as they come and go. If you must move, then do it purposely and efficiently with awareness. Then return to stillness. 3. Observe the sensations of your breath as it enters and exits the nostrils. If the mind becomes distracted, simply recognize that the mind has wandered off. Believe it or not, knowing that your mind has wandered is a moment of awareness. Then without judgment, as if nothing like that could ever bother you, simply return your attention to the breath. Within all of us, is a nature that is completely free, beyond fear, unbound to the fluctuating conditions that affect our daily lives. Tapping into the awareness that recognizes this freedom helps us avoid "sweating the small stuff", dissolves our feeling of separateness from others, and allows us to focus on the aspects of life that uplift ourselves and those around us." Spaces are filling up, so sign up soon to claim your spot! As director of Yoga Nepal, I’m always looking for ways to help yoga practitioners deepen their practice in and beyond the studio. 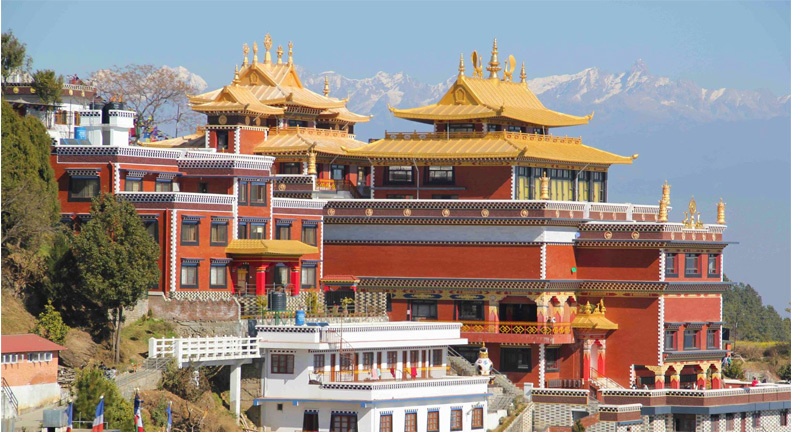 Our retreats in Nepal’s Kathmandu Valley give participants a chance explore the place where the Hindu and Buddhist cultures of the Himalayas converge. And when combined with practice, reflection and teachings from Buddhist masters, we all get a little closer to the real meaning of yoga. The entire valley is a designated UNESCO World Heritage site, and its many temple towns and its wealth of sacred monuments have inspired pilgrims and seekers for centuries. About 10 years ago my boyfriend and I set out on a trip through the Himalayan regions of South Asia for a little adventure and to deepen our understanding and practice of Buddhism. We were new to the Dharma, and like many Buddhist backpackers on the path, we went straight to Dharamsala, India, to attend His Holiness the Dalai Lama’s teachings. At the teachings, we met a pair of newlyweds on a kind of pilgrimage-honeymoon: a talented yoga practitioner named Samantha and her husband, Robert, a newly ordained Zen priest. Having spent years living and practicing zazen (zen meditation) at the Tassajara Zen Mountain Center, a Zen monastery in the California mountains, they were out in the world, exploring the Buddhist traditions of India, Nepal and Thailand. If you’ve done a lot of traveling then you know the kind of magic that can happen when you’re far from home meeting kindred spirits. Friendships form fast, and the conversation is never boring. We took walks in the Himalayan foothills together, and they shared with us their experience of living at a Zen Buddhist monastery and what it meant to commit to a life of practice. My boyfriend and I were happy to share our own experience practicing within the Tibetan tradition we’d traveled so far to learn more about. No doubt, there was some intangible connection among the four of us.I didn’t know it would be nearly a decade before we’d have the chance to explore it further. Samantha and Robert left for Nepal and Southeast Asia, and my boyfriend and I headed onwards to Tibet. And it looked like life was taking us in different directions too. James and I ended up in Kathmandu a few years later, where we immersed ourselves in the study of Buddhist philosophy and Tibetan language. Samantha and Robert returned to California and shifted their base to San Francisco. Robert became a spiritual and administrative leader of the San Francisco Zen Center. He later received “Dharma Transmission” in the Soto Zen tradition and began to teach Buddhist philosophy and meditation. Samantha completed teacher training at the Iyengar Yoga Institute of San Francisco and taught yoga classes with a therapeutic focus. She continued to incorporate her many years of Zen training into her teaching as well. Last year, I was in the planning stages for Yoga Nepal 2011, when I learned that Samantha and Robert had been sharing their gifts in a new way -- leading Zen Mind, Yoga Body retreats for the San Francisco Zen Center. By combining their rare and complimentary gifts, they’d discovered a new way to help people heal the body and mind. I had an idea. It was time for a reunion. Marni:What is it that motivates you to teach? Robert: I have been practicing Zen Buddhism rather intensely for over 17 years now, and for much of that time I have been practicing as just a simple monk, not so interested in becoming a Buddhist "teacher." I'm really a rather shy person, and I came to practice because I was causing myself and others around me great suffering. I wanted to find a way out of these seemingly endless cycles and patterns of suffering. I have always appreciated that Zen is a path of practice seeking a direct engagement with and understanding of the profound teachings of the Buddha. It is focused on waking up from the delusion that we are separate and permanent, and seeing how things really are: interdependent and impermanent. It was only after years of practicing Zen meditation and extending that meditation into each moment of my life, cultivating the practice of continuous mindful activity, that I really began to appreciate the subtle guidance of my teachers and how important it was that there were experienced practitioners there to meet me when I had questions about practice; that there were wise and compassionate human beings there to show me the way as I endeavored to open my life up to its full possibility and potential. After many years of practice I ordained as a Buddhist priest and now have received from my teacher what is referred to as "Dharma Transmission." This qualifies and supports me to wear the traditional Buddhist robes and pass on the lineage of Zen Master Shunryu Suzuki. For this I am extremely grateful. As a Zen "teacher" my way is to be a humble example of the Buddha's path that all humans can walk, to show others how they might enter and then continue on that path, and to express the truth of the way things are in simple, direct, straightforward language that others can understand and incorporate into their lives. This is not so much the role or title of the "teacher," but more the compassion and commitment of a "Dharma friend," or Bodhisattva, who vows to live life for the benefit of all living beings. Samantha: I teach yoga because yoga has been one of the practices that has brought the most healing and wholeness to my life, and I am passionate about helping other people find what for me has been most transformational, which is to turn our awareness inward towards our true self, our innermost spirit, and to listen and feel what that inner knowing, that inner voice is saying. So we can find out who we really are, what we really love in life, what we are really meant to do here in this life. We also gain invaluable insight into the deep patterns of our thoughts as we observe our responses to the poses, especially the poses that challenge us more. From observing our habitual responses, we see ourselves more clearly, we understand ourselves better, and we have a chance to free ourselves from our limitations. I also teach yoga because I love how yoga can bring us to a state of well-being and happiness physically, mentally and emotionally. For this retreat in Nepal, I will focus our yoga practice on making us very grounded, spacious, and well-aligned physically, so that we can be comfortable and at ease as we meditate together after the yoga practice. Marni: Why do you think pilgrimage and retreat are so important to a spiritual path? Samantha: We came to Asia 10 years ago on a pilgrimage because we were living at Tassajara doing intensive zen meditation practice for several years, and we wanted to see how people practiced and lived Buddhism in Asia. We had no idea how much it would change our ideas of what spiritual practice is, to see the Buddhist countries in Asia, and to see how monks and nuns and regular people approached their spiritual practice. What I loved to see was the physicality of the practice -- to watch an elderly Tibetan lady sitting there, turning her prayer wheel and saying a mantra for hours on end; to walk with the people in Boudhanath around the enormous stupa every morning and evening. Something gets enacted there that is very deep and powerful. I also loved to see how spiritual practice was an all-day thing -- you get to see things like how, first thing in the morning, a woman walks up to a tree and offers, with great love, a tray of offerings in front of it; or to see a woman place flowers on each side of her front door after sweeping in the morning. These are ways that spiritual practice is just part of life in Asia, and it makes life very meaningful. Robert: It’s very important for people to take time from their busy lives to practice. It is naturally very difficult within the normal daily momentum of our life for us to do anything different than what we always do. When we step out of the conditions that support the habit patterns of our life, we open ourselves to new conditions, to new ways of seeing the world, and encourage us to reconnect to parts of ourselves that we had forgotten about or had neglected. 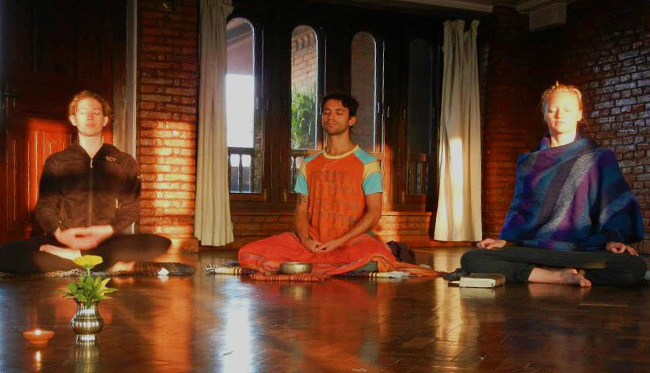 Retreats like Yoga Nepal also help us to find other people who are looking for ways to find peace and happiness in their lives, and to connect with something larger and more important that can have a profoundly beneficial impact on their life and the lives of those around them. Finding others on this path and connecting with them by practicing together as a little "mini-sangha" is a very powerful and life-changing experience. Marni:What can we learn by practicing meditation together with yoga? How do they inform one another? Robert: The purpose of Zen meditation is not to have some special "enlightenment" experience, but instead, it is to become aware and to see things as they really are. It is to see and understand in a deep way that our actions have consequences and that awareness in each moment is the foundation for benefiting ourselves and others. Learning to sit meditation is very important, but just as important is learning how to extend the calm, open, flexible, and ready mind of zazen (zen meditation) into each moment of our lives. In our yoga practice we get to practice with becoming more aware of how each thought, each emotion and action that arises in the present moment conditions the next. We get to see how the thoughts and habit patterns of our mind work, and we start to understand how they are helping us or not helping us. In this way we start, one moment at a time, to wake up form the delusion that anything is separate from anything else, and we see how the smallest adjustment -- in our mind or our body-- can have a profound affect on us. 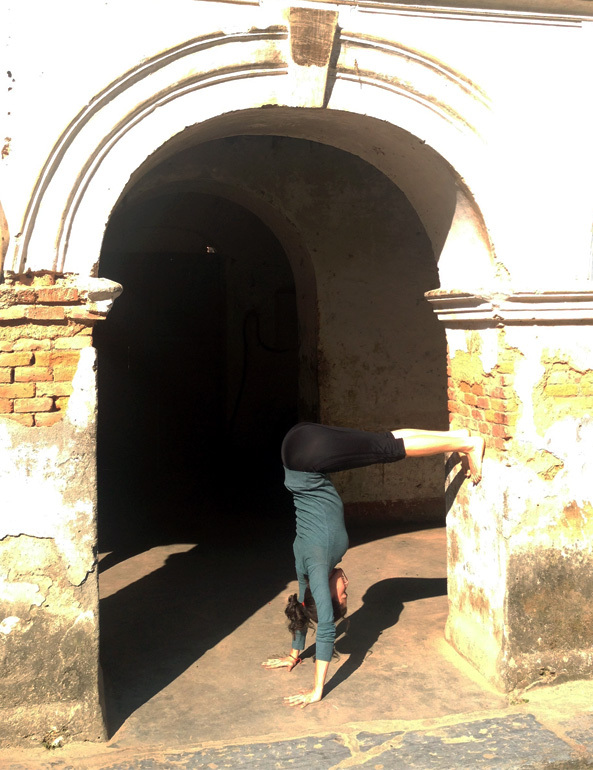 Marni: What inspired you to take this opportunity to teach with Yoga Nepal? What do you look forward to on this journey? 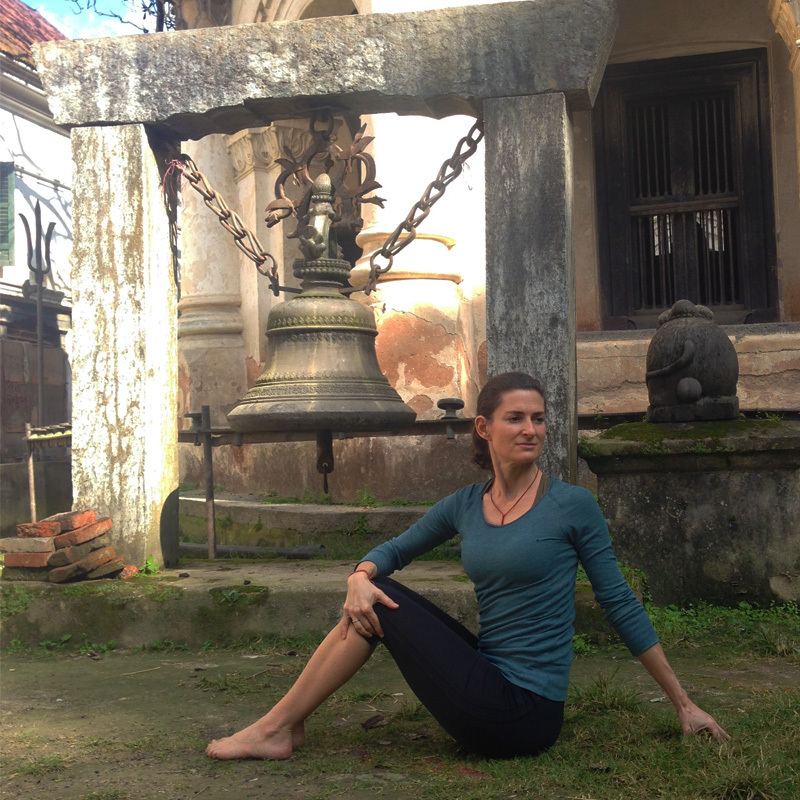 Samantha: To be invited to teach with Yoga Nepal is really a dream come true for me. Ten years ago when we went on our first pilgrimage to Asia, we were stunned by the effect that visiting sacred sites that had been places of intense spiritual practice for many generations had on us. We were on hallowed ground, and we really felt it. These sacred spaces have a lot of power to alter us in profound ways that we don't understand at first. I am also really excited to return to the Kathmandu Valley for the cultural tour -- there is such an incredible, rich history of cultures and religions there – I’m really looking forward to learning more along with all of the participants. Marni: It’s always been a dream of mine to bring the teaching of yoga and Buddhist meditation together. In a way, that’s what Yoga Nepal means to me – it’s a vehicle for truly exploring how these methods work in harmony. So I just want to thank you both for bringing your open minds, your warm hearts and all of those years of Zen and yoga training to Kathmandu for Yoga Nepal 2011. I have no doubt that this is going to be a very special journey. 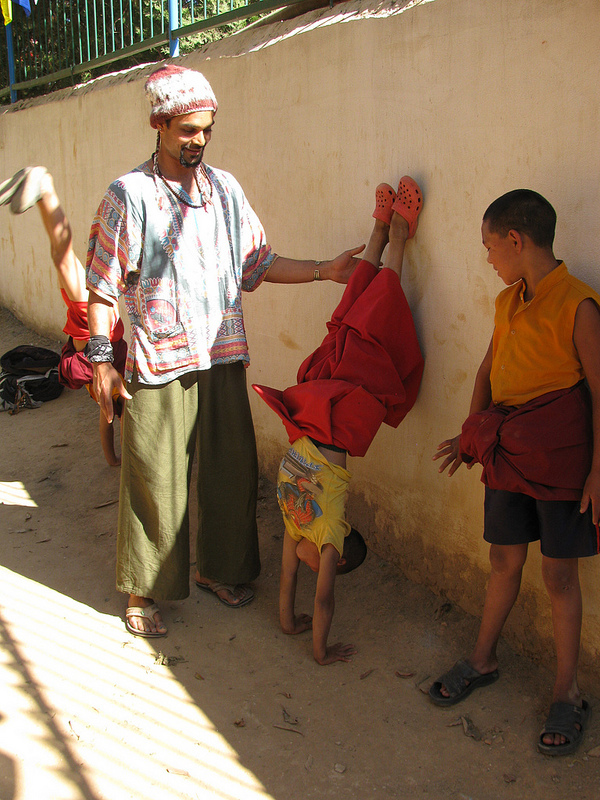 I truly cannot wait to see you and our Yoga Nepal “mini-sangha” in Kathmandu! Mindful Yoga and Zen Meditation is a reunion of sorts. A reunion of old friends not far from the place they first met ten years earlier, and for Yoga Nepal 2011 participants, a reunion of body and mind and a chance to reconnect with their innate sense of joy, spaciousness and ease. 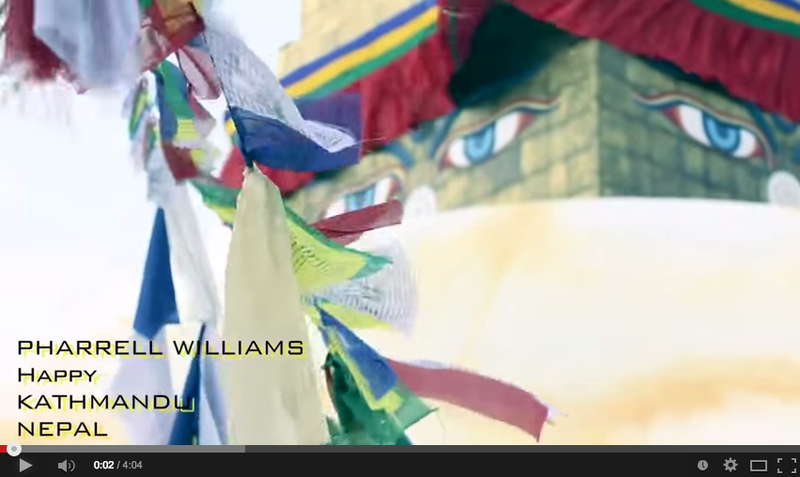 Robert and Samantha return to Yoga Nepal in March of 2015!